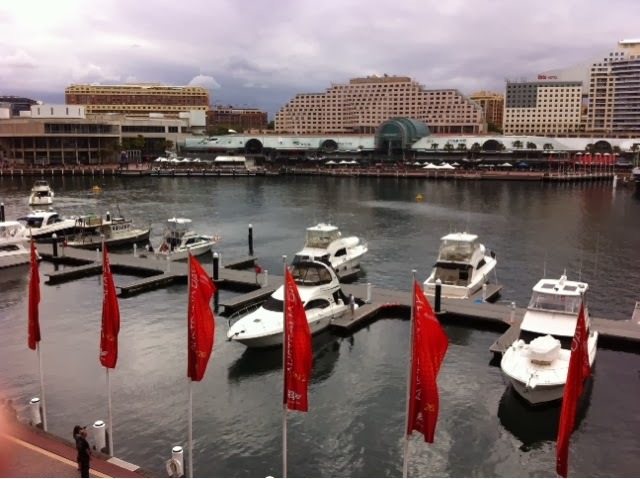 Blogged from a quiet spot over Darling Harbour. I realised today that, as a daily blog reader, a lot of what I tend to read are the fun, exciting things other bloggers do with their lives. It's the same with Facebook, the majority of posts, pictures, statuses are the good, positive aspects of peoples lives. The problem with this, we often to compare of lows to other peoples highs - 'why isn't my life like that?' But the harsh reality is, nobody's life is like that. Everybody has their bad days, we just don't always document them for the world to see. Yesterday was a bad day for me, which is quite apparent from the frantic ramblings of yesterday's post. When I have to make a decision, never mind several, I feel an overwhelming sense of panic and emotion; I've realised today, this shouldn't be the case. Plain and simple; why panic? Today, I met up with somebody that's fast become very special to me. We only had an hour but that hour has made me find some clarity in yesterday's panic. When discussing my next move from Sydney, I listed all my options and said 'I just don't want to make a bad decision' and was met with the response of 'no decision is a good decision'; and there you go - my clarity. Yesterday, I felt like the decision was life or death. Today, after a bit of unbiased advice, I feel like I can't make a wrong decision because who knows what's wrong and what's right? Nobody. All I can do is make a decision and see what happens. And at the end of the day, I'm in Australia. I'm here for 12 months to see the country, experience new things and figure things out - but the truth is, the first two will happen, the last - not in a million years. Yes, people have plans and goals but with there being no right and wrong in life, who can say 'yep, I've got it all figured out' - answer: nobody! So if and when you're met with a bad day, an overwhelming sense of panic or a decision to make, just sit, take a deep breath and think to yourself - no decision is a good decision and no, I don't have it figured out - just like everybody else. It'll make that decision so much more simple.